Data mining has evolved from the ethereal domain of the highly-skilled mathematician to the expert data miner's workbench tool and ultimately to widely accessible business applications. For decades, industry and academia have been engaged in far-reaching research and development of data mining. At the same time, businesses have been leveraging this research, exploiting a handful of algorithms most useful in finding information to help resolve business problems. Recent trends have made these algorithms and systems, which are rooted in solid research, available to a wide range of business users in easy-to-use forms. Large numbers of business analysts, who may not be data mining experts, can now solve high-value business problems using data mining technology embedded in database-resident business applications. 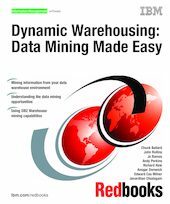 In this IBM Redbooks publication, we discuss the methodology and selected techniques of embedded data mining and show how sophisticated technologies can be used in today's business environment to create significant business value. All this is enabled by the IBM DB2 Warehouse (DB2W) data mining capabilities. Using DB2W, we show examples of using data mining capabilities for such analytic functions as data modeling, scoring, and visualization. In addition, there are scenarios and examples that help in understanding where, when, and how to use data mining. For techniques, technical details, and practical examples, this is the book you need.